What kind of wire do you use in electromagnets? You should use magnet wire. Duh. This is copper or aluminum wire with a thin insulation to prevent short circuits. It is single-strand wire insulated with enamel, varnish, cotton, glass, asbestos or some combination of these. To meet the immense variety of uses and to gain competitive advantage, a great number of kinds of enamel and of fiber insulations have been developed and are widely available. In general, materials such as cotton, paper, and silk are class O. Organic materials, such as oleoresinous and Formvar enamels, varnish-treated cotton, paper, and silk are class A. Asbestos, mica, silicone varnishes, and polyamide are class H, while various synthetic enamels fall in the B and F classes. The polyesterimide enamels, however, are capable of withstanding temperatures of 356-392F (180-200C). Almost all magnet wire is insulated soft-drawn electrolytic copper, but aluminum is being used more, especially in times when copper is scarce or high-priced and where space is not limiting. Round aluminum wire, being soft, flattens under pressure giving a higher space factor in coils than might otherwise be expected. At temperatures above 392F (200C) copper oxidizes rapidly; it also becomes brittle when under stress at such temperatures. Its high-temperature strength is increased considerably by adding a small amount of silver (about 30 oz/ton or 1kg/metric ton). Anodized aluminum is preferred for higher temperatures, up to 572F (300C) or more, while copper nickel wire with an anodized aluminum coating may be operated at still higher temperatures." If you have a wire size in mind and need to estimate another size, note that AWG (and SWG) size scale is based on the cross-sectional area (circular mils) and hence is a logarithmic scale. Each 3-gauge step in size corresponds to a doubling or halving of the cross sectional area. So, one simple result of this is that if you take two strands the same gauge, it's the equivalent of a single wire that's 3 gauges lower. So two 20 gauge strands is equivaent to one 17 gauge wire. If you are more interested in current-carrying ability than physical size, then remember that a change of 3 AWG numbers equals a doubling (or halving) of the circular mils (the cross sectional area). Thus, if 10 AWG is safe for 30 amps, then 13 AWG is okay for 15 amps and 16 AWG is good for 7.5 amps. Most current ratings for wires (except magnet wires) are based on permissible voltage drop, not temperature rise. For coilguns we usually choose wire sizes that will greatly exceed the "current rating" for its size. The most relevant figure would be its fuse rating or short-circuit current. For example, 0.5 mm^2 wire is rated at 3A in some applications but will carry over 8 A in free air without overheating. You will find tables of permitted maximum current in national electrical codes, but these are based on voltage drop (not the heating which is no problem in the current rating those codes give). 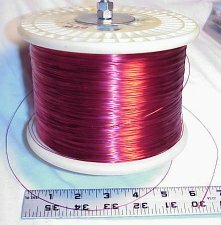 Visit one of the major wire manufacturers, WireTron, at www.wiretron.com for free software that provides lots of information about (what else?) wires. It can help you select and understand size, material, strength, resistance, maximum current, weight, insulation and other factors.